From Here to Eternity – based on the book and film – is Tim Rice’s new musical in previews in the West End this week. We were just passing through London and bought the cheapest of cheapie tickets (£15) instead of going to the pub or cinema. Then when we got there the balcony was shut and we were upgraded to middle stalls. Win? I enjoyed From Here to Eternity throughout. The cast were pretty good, the songs were nice, the story was interesting. Of particular note, the set was understated but very nicely done and the lighting was great and really added to the set and the ambiance. Darius Campbell did a solid job as one of the leads, he has a lovely voice and it was a confident performance. I was in the same year as Darius at Edinburgh University. I didn’t know him, but I knew people that did. Weird to think. I really liked the finale – which culminated in a song which was catchy, well presented and poignant. If I’d been more invested in the characters I’d have cried. But I wasn’t, so I didn’t. Because, honestly, it was all kind of bland. Despite having some racy content and language the production overall felt old fashioned and I can’t say I’ll remember a huge amount about it next week. It lacked… something. The other thing to mention is that the show was strewn with casual racism and homophobia, and I’m not sure how I feel about that. It wasn’t gratuitous, it was certainly in keeping with the time and often required to advance the plot. But… felt strange to a contemporary (and unashamedly PC-brigade) ear. From Here to Eternity is a new musical by Tim Rice and with Darius in one of the lead roles. It only opened on Monday, and we bought cheap tickets before then in the spirit of adventure. As it turns out we needn’t have rushed, the upper circle wasn’t in use at all and we got upgraded to pretty good stalls seats. The show is set in Hawaii in the run up to the Pearl Harbour attack, and follows the soldiers of G-company, most of whom have enlisted for a 30-year stretch to escape the great depression, not really expecting war. The story follows the relationships, romances, and tribulations that ultimately end in a series of tragedies almost unrelated to the violence of war. It sounds like all the right ingredients are there for a dramatic and ultimately poignant show, but it never really felt like it got going properly. A very pleasant way to pass a couple of hours, but not a musical likely to become a new classic! 3.5* from me! 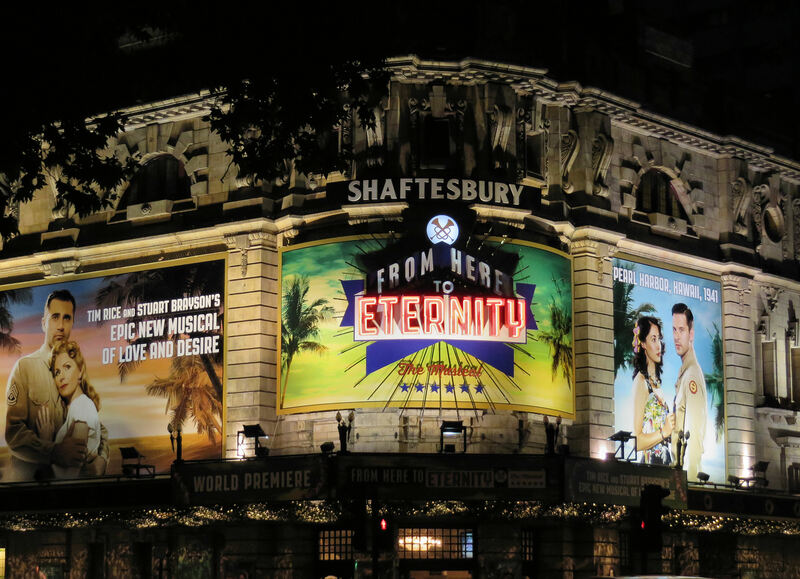 The show you saw was one of the first previews of ‘From Here To Eternity’. Each day something changes, which is why it’s previews before the show is open. I love this stage of the musicals development when you watch it grow to the final product. They rehearse changes in the morning to be performed that night. By the 23rd October we’ll have the finished product. Really looking forward to seeing that but really glad I saw the preview to see the changes.